Scientists pride themselves on being keen observers, but many seem to have trouble spotting the problems right under their noses. 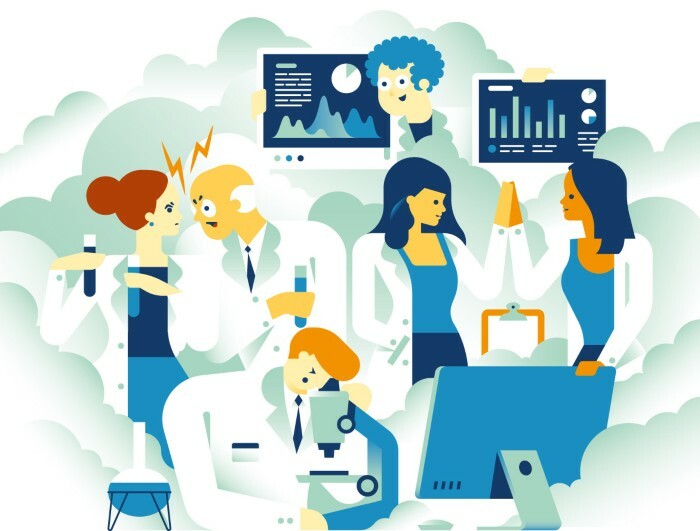 Those who run labs have a much rosier picture of the dynamics in their research groups than do many staff members working in the trenches, according to a Nature survey of more than 3,200 scientists. The results suggest that a lack of training in lab and personnel management is one of the strongest contributors to an unhealthy lab culture. Concern over the integrity of the research enterprise has been mounting for years, and has triggered high-level studies by the US National Academies of Sciences, Engineering, and Medicine and the US Office of Research Integrity, among others. They have been looking to understand training gaps and the ever-increasing pressure on scientists to secure grants, publish papers and earn promotions. Last year, Nature convened 16 meetings and workshops in universities across Europe and the United States to explore the state of lab health, pressures on individual groups and how best to tackle them. Scientists shared what they liked and loathed about their workplace, from navigating interpersonal relationships to enforcing and encouraging best practices. Nature’s survey grew from these discussions, in an effort to back up such anecdotes with data. It is the largest publicly reported analysis of its kind. The encouraging news is that morale is reasonably high. 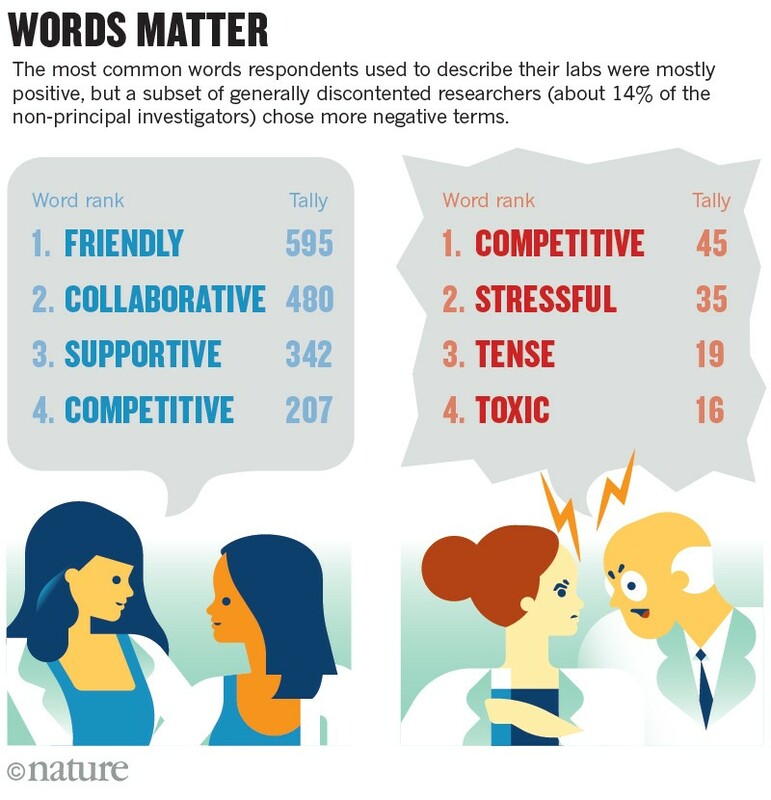 For the most part, scientists around the world view their groups as healthy — calling them ‘friendly’, ‘collaborative’ and ‘supportive’. But signs of stress bubble underneath the surface: around one in five respondents in more junior positions (that is, those who don’t lead the group, such as graduate students and postdoctoral fellows) were negative about their labs, describing them as ‘stressful’, ‘tense’ and ‘toxic’ (see ‘Words matter’). Scientists who took the survey said they wanted more principal investigators (PIs) to take training courses, and suggested that PIs ask for feedback from their lab groups more regularly. And slightly more than half of non-PIs said they had often or occasionally felt pressured to produce a particular result in the past year. “That’s very alarming,” says Jeffrey Flier, a physician-researcher at Harvard Medical School in Boston, Massachusetts, and dean of the faculty of medicine until 2016. Nicholas Steneck, who studies research integrity at the University of Michigan in Ann Arbor, cautions that the survey, which was sent to more than 250,000 Nature readers and advertised on the magazine’s website, reflects a limited sample of scientists and might over-represent those who are interested in complaining. But he argues that it still shows an unacceptable level of tolerance for bad behaviour. “I am not sure I see any good news in the survey, just different degrees of bad news,” he says. The senior researchers who responded — 655 lab heads — were hugely positive about their workplace practices. More than 90% said that they consistently reviewed their research group’s experimental designs and could summarize which projects every member of their group was working on. They were equally confident about their availability to discuss staff members’ experiments or career development; that they valued negative results; and that they gave their scientists freedom to explore interesting findings that were not necessarily core to the lab’s research activities. The 2,632 non-PIs sampled were much less optimistic (see ‘Perception gap’). 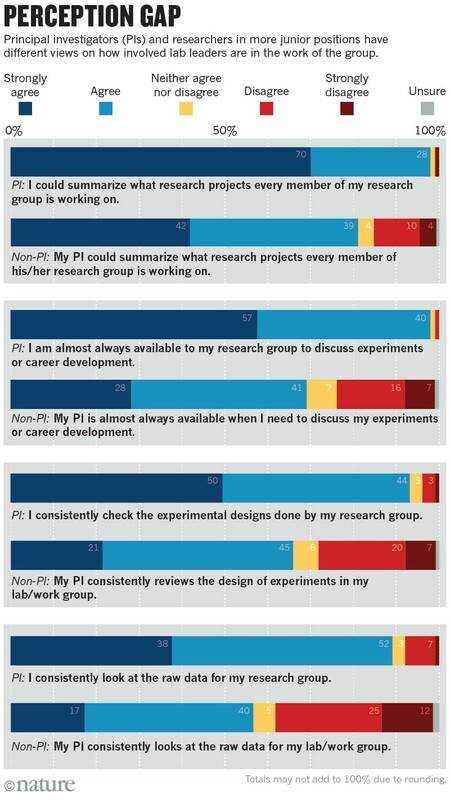 About 80% agreed their PIs could summarize each group member’s project; around 70% that their PI was readily available for discussions and let them explore non-core results. Just two-thirds said that their PI consistently reviewed the design of experiments or valued negative results. A particular disconnect came in attitudes towards checking raw data. Just 57% of lab members said their PIs consistently checked raw data — but 90% of PIs said they did. Given the time crunch involved in juggling staff management with applying for grants and other duties, “I doubt if such PIs will check raw data with the consistency they claim,” says Angela Goh, a computer scientist who retired this year as associate provost at Nanyang Technological University in Singapore. The gap is striking, and it might be that PIs and other researchers have different definitions of ‘raw data’, says C. K. Gunsalus, who studies research misconduct at the University of Illinois at Urbana-Champaign. Radovan Šebesta, who leads an organic chemistry group at Comenius University in Bratislava and took the survey, was surprised by the findings and a little concerned about the problems identified by junior researchers: “Is what I do perceived in the same way by my group?” Šebesta is thinking of asking his lab members how they would have answered the questions. Most of the survey respondents chose to remain anonymous, so it is not possible to match PIs and non-PIs to the same labs. But the two groups did not show significant geographical differences. And the findings dovetail with established social-psychology results about the dynamics of organizations, says Gunsalus. “The more power you have, the less attuned you are to how actions are perceived at the lower levels,” she says. The same perception gap was evident in other parts of the survey. Almost 90% of PIs felt that their lab or group members were clear about what was expected of them, and two-thirds said the group ‘never’ or ‘rarely’ condones research practices that cut corners — such as valuing speed over quality, or fundability over accuracy. Only two-thirds of non-PIs said that they personally were clear about what their PI expected of them, and only 43% felt their group never or rarely cut corners. Although these opinions and attitudes might not reflect a reality of wrongdoing in labs, Steneck and others see them as warning signs. Previous research on individual organizations has shown that scientists who perceive their lab climates to be favourable are less likely to say they partake in practices that would be construed as misconduct, such as plagiarism, falsification and fraud. To get a sense of researchers who felt truly dissatisfied with their lab culture, Nature identified a group of scientists who were consistently negative about their experiences. They used words such as ‘abusive’, ‘oppressive’ and ‘hostile’, and reported that the bad vibes in their lab harmed their work. These discontented researchers made up around 14% of the non-PIs — 376 scientists. Although they do not represent all the unhappy respondents, they reflect a group that clearly and consistently voiced frustration. Many of them seemed to be dissatisfied with lab leadership; their perceptions of PI behaviour were relatively negative. Just 20% felt their lab’s culture never or rarely condoned corner-cutting, and only 38% felt their PI was almost always available for discussions. And 70% of them said that in the past 12 months they had ‘often’ or ‘occasionally’ felt pressured to produce a particular result, compared with slightly more than half of all non-PI respondents. It can’t be known whether this group is genuinely experiencing a much worse lab culture than other respondents, Gunsalus notes. “But there are some horrible environments out there, for which institutions should be held accountable,” she says. 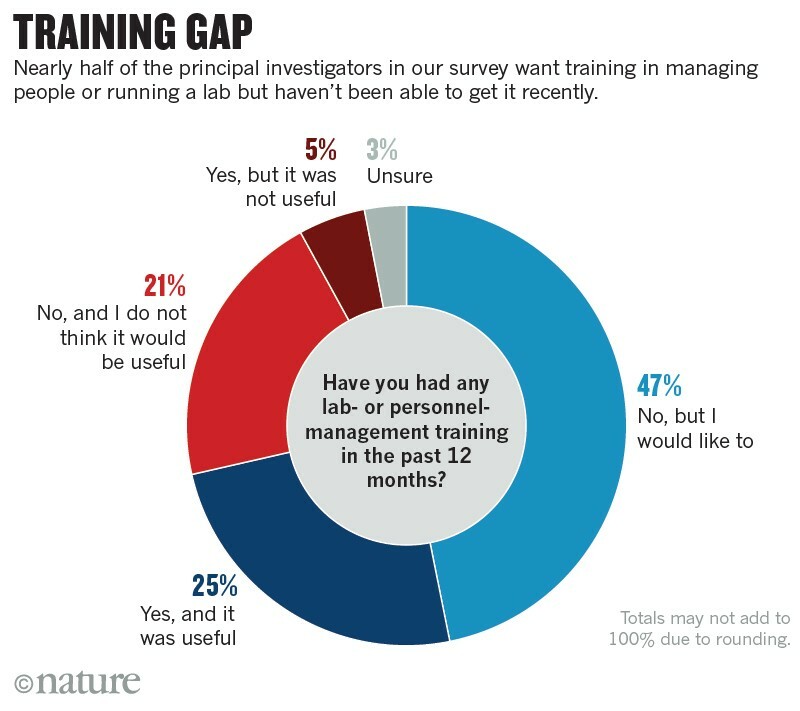 In one of the survey’s starkest findings, two-thirds of researchers who head laboratories said they had not had training in managing people or running a lab in the past year — and the majority of those said they wanted some (see ‘Training gap’). “One of the biggest surprises of my PI career is how difficult the management part is,” says Šebesta. “I would love to have had some training.” And of the PIs who had received training, five-sixths found it useful. Many institutions, including the Howard Hughes Medical Institute in the United States and the European Molecular Biology Organization, have set up highly subscribed courses in mentoring and management. But most don’t mandate such training, says Flier. That might be partly out of reticence to force it on academics, he says — and because “institutions don’t rate it that highly”. The results suggest that training is sorely needed, says Michael Mumford, a psychologist at the University of Oklahoma in Norman. “We take people with no management or leadership training and tell them to run a team of 3–20 people and assume they should just know how to interact and how to manage others,” he says. Asked to choose from a list of options for how their department head or institution could help their lab to produce higher-quality research, more than 60% of the PIs said they wanted more support for mentoring and managing (see ‘Factors to fix’). That desire came second only to a request for more resources for administrative tasks. More than 40% of the non-PIs also said their lab could do better science if PIs received more training in mentoring and management. Among the least happy, more than 70% indicated that this was their main desire. “I believe my institution has courses for PIs, but for some reason, they are optional. I think they should be a requirement,” wrote one microbiology graduate student in Germany. Asked whether any other factors might help, more than half of lab heads mentioned funding — a common refrain in discussions about limits on research. “The competition for funding, as well as the short-term nature of the funding one gets, creates an atmosphere where scientific reproducibility counts far less than getting the next grant,” wrote one US lab head. The survey should be a signal that even if PIs think their lab has a healthy research culture, it is important to revisit communication and goals, and to seek feedback from those they manage, says Gunsalus. “Even if your own institution doesn’t provide it, there are mentoring resources out there,” she says. In the United States, she points people to the National Research Mentoring Network and a collection of articles on leadership from the National Center for Professional & Research Ethics at the University of Illinois at Urbana-Champaign.